This is real. And real bad. The two Friends stars travel to MS headquarters to talk to Bill Gates about promoting W95. Hilarious antics ensue (not really). However, I didn’t/couldn’t watch the whole thing. 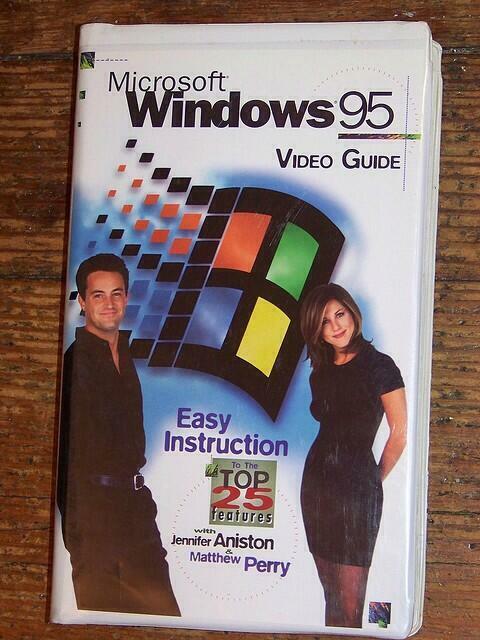 So Friends is as old a W95. Let’s date other sitcoms and Microsoft OSs. This year I stopped using Powerpoint slides in my lectures. Well, not completely. It can deliver some content better. Many student remarked to me that it was a better experience. No doubt the students who felt differently would be less likely to tell me that. According to this article in the Atlantic students retain more information if notes are taken by hand than typed. Interesting. If I ditch powerpoint and ban laptops in class that would waste the expensive infrastructure the university has installed. Surely, the university conducted a study on the efficacy of this teaching methodology before investing such large sums in projectors and classroom wireless. So this study must be bogus. We have long noted that NetApp is a software company that wraps hardware around its software. While this is an intentional over simplification, it makes the point that NetApp’s primary value add is ONTAP (their OS/Filesystem). This wasn’t noted about EMC, partly because it owns VMware and partly due to ignorance. But EMC may be no different from NetApp in this respect. EMC has unbundled their VNX software from their hardware. Read about it here. Such a move is dramatic. It opens the way for complete commoditization of hardware. It is not clear how this will shake up the industry. Hopefully, it leads to healthy competition resulting in lower prices and greater choices for consumers. Of course that is not EMC’s motivation. It may be reactive because they feel the sun is setting on enterprise SAN (and NAS) and this is the best way for VNX to remain relevant. Sony has increased bit density of tape to 148GB per square inch up from the previous record fo 29.5GB. That is about 6 Blu-ray DVDs per square inch. A single tape cassette can hold 185TB. Tape storage will still be a niche because access is slow and non-sequential access is death. Read more here. After the incredulity and laughter, we had two thoughts: (1) What will PETA do when it hears about this? and (2) Is it cost effective? We will have to wait on the answer to (1). But we can get some idea about (2). A cow produces 300 liters of methane per day. According to this government site, the residential price for natural gas on 14 Feb 2014 was $9.76 per 1,000 cubic feet. Finally, there are approximately 28.3 liters per cubic foot.